I know this is just supposed to be a website extolling the virtues of great tea, served in great surroundings, by great people. But whilst it has all of this in abundance, there's so much more to The King of Hearts than these wonderful things! As you would expect from any establishment receiving a Great Tea thumbs-up, TKOH serves nice strong tea in a proper pot. There is a decent selection of tea blends available too (14 varieties all in all), including decaff and fruit teas. Coffee (if you absolutely must) is fairly traded. Service is welcoming and cheery - despite the fact that I went there when it was really quite close to closing time, staff were happy to toast me a teacake to go with my tea. From the looks of the menu, TKOH offers a wide range of keenly priced cakes, pastries and other tea-accompaniments; from the fact that they had virtually all sold out by the time of day I went suggests to me they must be pretty tasty. The café itself is a bright space, with lots of natural light and decor that is heavy on the pine. A nice touch is the way in which TKOH's status as an arts venue finds its way into the café too - their Arts In The Café programme sees work being displayed on the café walls. Selected works are sometimes for sale too, if something really catches your eye as you sip your tea. The King of Hearts then - more than just a great tea shop, a bona fide arts hub... and still selling great tea! Lymington is a lovely little town, right on the edge of the New Forest. If, like me, you're interested in cars, it's only a few short miles from the national motor museum at Beaulieu too. The town itself is a bustling place with some excellent shops and a lively high street... and slap bang in the middle of that high street is Lounge's. 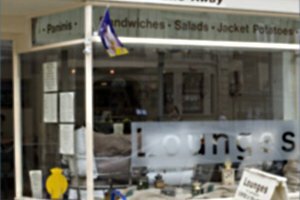 The modern decor of Lounge's is complemented by great natural light from the big shop-front windows; this, together with a array of comfortable seating options, makes for a very relaxed place to spend a while. In fact, it's so relaxing, it's a good job that newspapers and magazines are laid around for the clientele to read, otherwise there's a very real risk the place would soon be full of snoozing patrons! Tea is good and strong, and served in a proper pot by smiling staff (and I cannot over-emphasise how important smiling is - if you own or work in a tea shop, please take note). There's a bewildering array of munchables to go with your tea too - proper cakes, biscuits, sandwiches and a limited hot food menu (paninis, jacket spuds, that sort of thing)... all are present and correct. One menu addition that does deserve a special mention, however, are the milkshakes in Lounge's. These are made with the kind of flavour syrups that are normally added to coffee (indeed, Lounge's use them for that too), and plenty of ice cold milk. The result - and this is a phrase I never imagined I would use - is a milkshake of biblically good taste! So if it's a really hot day and you fancy a break from the tea, or are just really thirsty and need two drinks, then a milkshake is the only choice - it's that good. Fortunately for you, me and this website, so's the tea! It's a curious little place, Kitty's Café. 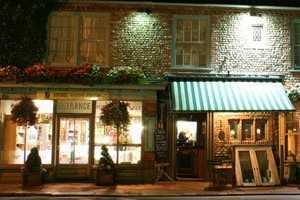 First of all its location, in a tourist draw like Framlingham, is far from ideal - rather than being central, near the excellent Castle or charming square, Kitty's is sort of on the road out of town. Then there's the premise - Kitty's is not the main focus of the business, but instead seems to be a bit of a sideline to the excellent Kitty's Home Store and, in fact, can only be reached by climbing a narrow flight of stairs from the back of the store. And finally there's the café itself... which is tiny! Maybe four tables of seating area, and you're virtually sitting in the kitchen! All of which sounds like a recipe for disaster but guess what? It isn't! In fact, it's quite the opposite. Maybe it's the fact that there are newspapers strewn around for you to read as you sip your tea (and decent titles too, like The Independent - no tabloid tat here). Maybe it's the fact that you have a choice from the wonderful range of Tea Pigs tea. Or maybe it's the fact that, because you are virtually sat in the kitchen (not true actually, but that's sort of how it feels) there is a feeling of popping in to visit friends when you go to Kitty's for a cuppa. And I must emphasise that this was not the case for me - I don't know Kitty, or any of her staff, from Adam, yet I still felt more welcome than I had any right to expect. The accompanying menu is superb too. As you would expect from a business empire that also includes Kitty's Cakes, well, the cakes are excellent. And sandwiches are tasty and freshly made to order (well, mine was at least). And most importantly, the tea is excellent, as you would expect from a Tea Pigs reseller. There's plenty of choice, with decaff and an extensive range of tea blends and fruit teas all available. Good stuff. Maybe it attracts a different crowd in the summer months, when tourist numbers heading to and from the Castle are at their peak, but on the drizzly spring day I visited it truly felt like locals, most of whom knew and were known to the café staff, were popping into Kitty's as a part of their routine - you know, read the paper, have a cuppa, catch up with people. All in a tiny café that feels like a tidy corner of a friend's kitchen. Truly social tea. There can't be too many better environment for drinking a nice cup of Rosie, can there? 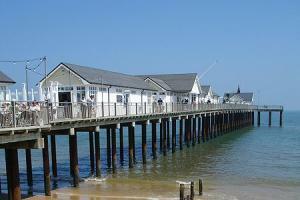 The Clockhouse forms part of the truly wonderful Southwold Pier. I could enthuse at length about the Pier's excellent Under The Pier arcade, or the Water Clock but I won't, because what we're here to talk about is great tea. Lucky for all concerned then that The Clockhouse, halfway along Southwold Pier, has this by the bucket-load. The Clockhouse is slightly odd (as is much of the Pier but relax, it's odd in a good way) in that as well as being a tea shop it also sells unusual toys and children's clothes... but let's concentrate on the tea shop bit. I had a pot of Pier Blend tea, which tasted suspiciously like English Breakfast to me, but let's not split hairs. The tea was served (with a smile, I might add) in a reassuringly heavy pot, with a proper cup and saucer and a matching jug of real milk. No UHT cartons here! The accompanying menu is pretty good too. In addition to the standard fare of biscuits, cakes and pastries there were muffins, waffles and ice cream sundaes to be had too. And for the less parochial tea drinkers amongst you, decaff was available, as was an extensive range of tea blends and fruit teas. Spoiled for choice really. And then there's The Clockhouse's other great selling point - it's location. Once you've got your tea, you can either take it out onto the pier to drink in the sunshine, or pull up a stool and sit inside (out of the wind or rain, if British weather is conforming to type) and have a nice warm view of the sea rolling gently up onto Southwold's sands. It's almost like being in someone's conservatory, with lots of natural light in a very cosy, almost sleep-inducing setting. I can't prove that such a location adds to the taste of the tea, but it certainly adds to the enjoyment. In the heart of Norwich city centre, you'll find Britain's largest permanent open market... and in the heart of that open market, you'll find a plethora of food and drink outlets. Really, there's something for virtually every taste, from the hog roast stall to the Chinese noodle bar, and everything in-between. But if you just want a really excellent cup of tea, the best place to go to is Deb's (straddling rows E and F of the market). There's nothing pretentious about Deb's Tea Stall, to give the place its full name. Tea is hot, wet and brown, made in an industrial-sized stainless steel pot with unbranded tea bags and with water from a boiler. The only choice you have if you want a cuppa is whether to add sugar or not. Yet somehow... somehow, this all works out okay. The tea tastes great. It's served to you in a proper mug, by upbeat staff who seem happy to see you. And you can drink your tea leaning on the stall's little bar, watching life ebb and flow around you, as the citizens of Norwich throng around and through their market. It's brilliant, if I'm honest. The best time to go is a couple of hours before kick-off on a match-day, when a satisfying proportion of Deb's customers seem to have Norwich City scarves around their necks, and talk is of the Canaries' prospects for the afternoon ahead. And that's the point of somewhere like Deb's really. 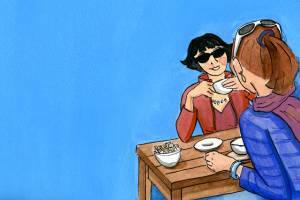 In addition to the big mugs of strong tea they serve, you can actually just talk to random people over your cuppa, and that's got to be a good thing, hasn't it? The tea "bar" lends itself to having a chat with other customers and, even more so, with the staff behind the counter. So even if you go on your todd, having a cup of tea from Deb's can be a social experience. Even if that isn't your thing, and I know it isn't everybody's, there's no better place to peoplewatch in the city than the market... and here, you can do that over a proper cup of tea. 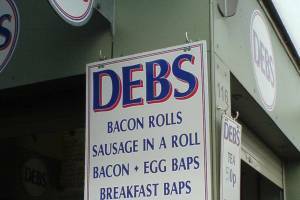 On top of all this, Deb's serves good, honest market stall food too - their bacon baps are particularly good, especially when washed down with a mug of tea. There's a smattering of cakes and biscuits in the cabinet too but these are pre-packaged and pretty ordinary, to be honest, so if you're hungry whilst you're here you really are better off getting something where freshly cooked bacon is involved. So, this is an unashamedly downmarket, budget tea shop - sorry, stall - but that doesn't matter. Cast aside your prejudices and head to Deb's for a proper cup of tea at a bargain price... and get a slice of Norwich life for free. It should come as no surprise that in a town as overrun with French tourists as Canterbury is in the summer months, a French-themed teashop should thrive. And thrive it does. But this is no half-arsed stab at a Gallic teashop - it isn't France-lite. For the owner actually is a French gentleman (pardon, monsieur) and many of the staff are genuine French speakers, which lends great authenticity to the situation. If you're so inclined, you can ever order in French. Sacre bleu! Enough of the Gallic angle though - what of the fare? Well, the tea is good and strong, served in a small cup/saucer combo that is as far removed from the Anglo-Saxon mug as it is possible to be. As you would expect, the baguettes and pastries (croissants, pain au chocolat, and so on) are top-notch too, especially when washed down with such decent tea. 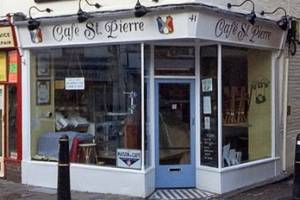 One slight drawback of Café St Pierre is its size - it really is rather diminuitive. To combat this, some tables make it out onto the pavement in warmer months - very European - and there is a little patio at the back of the premises, so you can drink your tea in the fresh air: always a winner! As is the case with many of the teashops here on Great Tea, food and drink can be ordered to take away too. In addition, Café St Pierre also sells speciality breads, giving it something of a boulangerie feel. Plus they have some sort of connection with a local French language course that aims to teach the language (and socialise) whilst baking French bread - a brilliant idea. All in all then... si vous aimez le thé, allez à Café St Pierre tout de suite! There is so much to like about Byford's. Yes, they have a tremendous deli adjoining the café. Yes, they have a wonderful "posh" B&B upstairs. Yes, they have a proper restaurant too. And yes, the whole kit and kaboodle is situated in the heart of that most charming of Norfolk market towns, Holt. But the café is what I want to talk about here. There's a healthy selection of tea blends on offer, though your reviewer stuck with the conventional English Breakfast for his taste test. I'm happy to report that this more than measured up - good and strong, with proper colour - a nice opaque brown, with none of the "dishwater" transparency you often get with weak teas. Plenty of taste too. The café is a little bit of a warren, to be fair, with entrances from both the street and the deli. 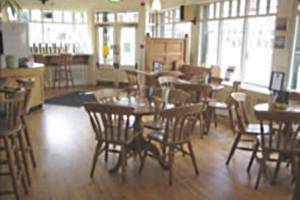 If you can, try and sit near the front - the room has more character than the refurbished area near the deli entrance. In summary, Byford's serve tremendous tea, and can offer a bewildering array of lovely things to eat too (their Millionaire's Shortbread defies belief). The staff are uniformly friendly and, crucially, smile at the customers. Produce, wherever possible, is locally sourced, some of which you can buy in the deli afterwards to take home with you. And they run a lovely pub called The Pigs in nearby Edgefield too. What's not to like? In other words, then, if you find yourself wanting a cup of tea in or around Holt, this is the place to go.